Sri Lanka’s monsoon rains activate twice per year a blossoming of emerald-like peppercorn clusters from spiraling vines of lush green foliage. 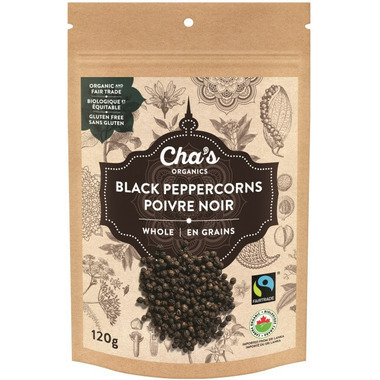 Cultivated by organic growers on biodiverse spice gardens, these are harvested and sun dried to produce Cha's Organics Fairtrade certified Black Peppercorns. With an intense flavour and fiery, exotic taste owing to it’s high piperine content, Cha's Organics Black Pepper will enliven all of your favourite dishes and and make your taste buds smile. Cha's Organics has always stood for a fair deal for farmers. That's why Cha's Organics products have been Fair Trade from day one. In addition, 1% of the sales of this product will go towards protecting Sri Lanka's wild elephants.